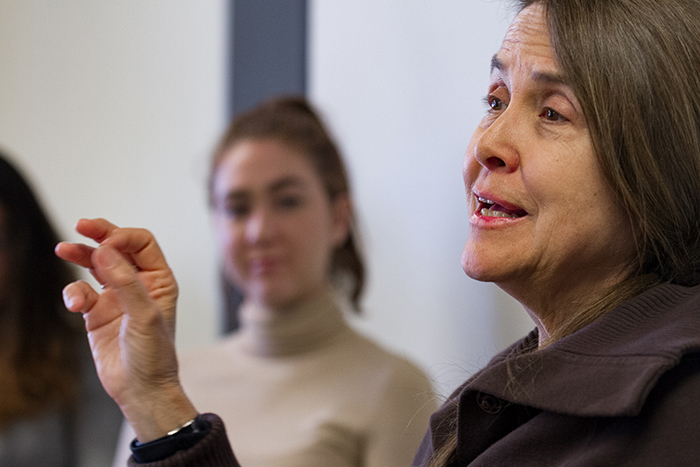 Poet Naomi Shihab Nye speaks with students studying literature, creative writing and cultural studies during her March 5-6 residency. Photo by Carl Socolow '77. It’s a tall order. And, Su notes, they found a natural choice this year in Naomi Shihab Nye, a foremost American poet whose works were woven into Dickinson culture long before she set foot on campus. A Lannan Literary Fellow, Guggenheim Fellow and recipient of the Library of Congress’ Witter Bynner Fellowship and the Voertman Poetry Prize, Nye is the author and/or editor on more than 30 volumes and also has written and edited collections of poetry and fiction for young readers. Her collection 19 Varieties of Gazelle: Poems from the Middle East (2002) was a finalist for the National Book Award. She appeared on the PBS poetry special “The Language of Life with Bill Moyers,” and in 2010, was elected to the board of chancellors of the Academy of American Poets. Poet Naomi Shihab Nye poses with students on the steps of Old West. Photo by Carl Socolow '77. Nye is the 13th esteemed writer to serve a Stellfox residency at Dickinson; past honorees are Edward Albee, Rita Dove, Ian McEwan, Margaret Atwood, Lorrie Moore, Paul Muldoon, Mario Vargas Llosa, John Patrick Shanley, Edwidge Danticat, Richard Russo, Maxine Kumin and David Henry Hwang. Like her predecessors, she posed for the traditional Stellfox photo on the steps of Old West, recreating an iconic 1959 photo of Frost; shared meals with students and faculty members; and visited with students in four literature and creative writing classes who’d been studying her work closely. Skylar Devitt ’21, a recently declared English major who’s taking Assistant Professor of English Chelea Skalak’s Introduction to Literary Studies class this spring, seized on the opportunity to solicit practical advice on how to carve out time for writing and how to combat writer’s block. “She really reinforced what I had heard before but also brought up other ideas that I’m really interested in,” Devitt said. Poet Naomi Shihab Nye takes a moment to chat with a Dickinson College student. Photo by Carl Socolow '77. Nye also delivered the traditional Stellfox lecture, reading poems that connected everyday observations with universal experiences and weighty issues like political and cultural discord, bullying and gun violence. Her work, which draws on her Palestinian-American heritage, was often tinged with wry humor, and drew laughter from the crowd. The residency marked Nye's first public reading on campus, but not the first time her words were performed. In 2015, the College Choir premiered a commissioned work by Mohammed Fairouz that set two of Nye's poems to music. Last spring, graduating senior Monica Thapa '17 read Nye’s poem “What Will Happen” during her Baccalaureate ceremony. Speaking to a sizable audience in the Allison Great Room, Nye said she was inspired by the students she met, the warm welcome she’d received and the creative projects they’d described.